orbiting a star that has formed a stunning "planetary nebula." Astronomers have discovered eight new exoplanets that may be capable of supporting life as we know it, including what they say are the two most Earthlike alien worlds yet found. All eight newfound alien planets appear to orbit in their parent stars' habitable zone - that just-right range of distances that may allow liquid water to exist on a world's surface - and all of them are relatively small, researchers said. "Most of these planets have a good chance of being rocky, like Earth," study lead author Guillermo Torres, of the Harvard-Smithsonian Center for Astrophysics (CfA), said in a statement. 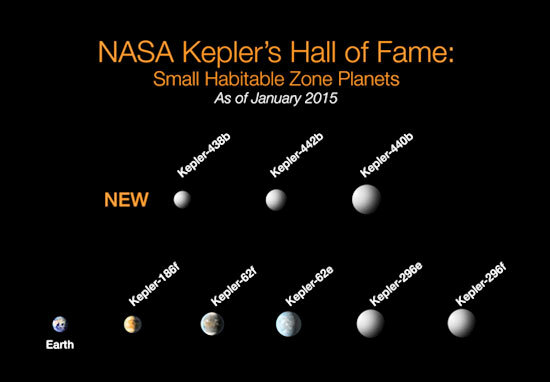 The haul doubles the number of known habitable-zone planets that are potentially rocky, study team members said. The newly discovered worlds were all detected by NASA's prolific Kepler space telescope, then confirmed using observations by other telescopes and a computer program that assessed the statistical probability that they are bona fide planets (as opposed to false positives). While none of the eight is a true "alien Earth," two of them - known as Kepler-438b and Kepler-442b - stand out for their similarities to our home planet (though both worlds orbit red dwarfs, stars that are smaller and dimmer than Earth's sun). Kepler-438b, which lies 470 light-years from our solar system, is just 12 percent wider than Earth and has a 70 percent chance of being rocky, study team members said. The planet completes one orbit every 35 days and receives about 40 percent more energy from its star than Earth does from the sun. Kepler-442b is about one-third larger than Earth, and has a 60 percent chance of being rocky. The exoplanet's orbital period is 112 days, and it gets about two-thirds as much energy as Earth, scientists said. Kepler-442b is about 1,100 light-years from Earth. As intriguing as these two worlds are, there's no guarantee that either of them could actually host life, team members stressed. "We don't know for sure whether any of the planets in our sample are truly habitable," co-author David Kipping, also of the CfA, said in the same statement. "All we can say is that they're promising candidates." Such hedging is unavoidable at this point, because researchers just don't have enough information. Furthermore, a planet's surface temperature is highly dependent on the composition and thickness of its atmosphere, and nothing is known about the air surrounding Kepler-438b, Kepler-442b or any of the other newfound worlds. But he's not discounting the life-hosting chances of the other five. "All of these planets are small, all of them are potentially habitable - and, in fact, have a more than a 50 percent chance of being in the slightly extended habitable zone - and all are interesting," Caldwell, who's based at the SETI (Search for Extraterrestrial Intelligence) Institute in Mountain View, California, said during a AAS press briefing today. Other big exoplanet news was announced today at the AAS meeting as well - namely, that scientists have identified 554 new planet candidates in the Kepler mission's database, bringing the number of total Kepler candidates to 4,175. Just over 1,000 alien planets identified as potential worlds by Kepler have been officially confirmed to date, but it's likely that around 90 percent will eventually be validated, mission team members say. Among the newly announced 554 candidates are eight that are small (between 1 and 2 times as wide as Earth) and orbit in their stars' habitable zones. Six of these eight potential planets circle a sun-like star. "These candidates represent the closest analogues to the Earth-sun system found to date," Fergal Mullally of the Kepler Science Office said during today's AAS news conference. "This is what Kepler has been looking for. We are now closer than we have ever been to finding a twin for the Earth around another star." The $600 million Kepler mission launched in March 2009 to determine how common Earthlike planets are throughout the Milky Way galaxy. And last year, Kepler embarked upon a new, two-year mission called K2, during which the observatory is searching for planets in a more limited fashion and is also studying supernova explosions, star clusters and other cosmic objects and phenomena. Kepler has discovered more than half of all known exoplanets. The total alien-planet tally currently hovers around 1,800; the number differs slightly depending on which database is consulted. observing alien planets in deep space using the transit method. since its launch in March 2009. Kepler reached the milestone today (Jan. 6) with the announcement of eight newly confirmed exoplanets, bringing the mission's current alien world tally to 1,004. The telescope has also spotted 3,200 additional planet candidates, and about 90 percent of them should end up being confirmed, mission scientists say. Furthermore, a number of these future finds are likely to be small, rocky worlds with temperate, relatively hospitable surface conditions - in other worlds, planets a lot like Earth. including the eight small, potentially habitable worlds here. Scientists announced Kepler's 1,000-planet milestone on Jan. 6, 2015. "So we're just kind of ramping up toward those most interesting results," she added. 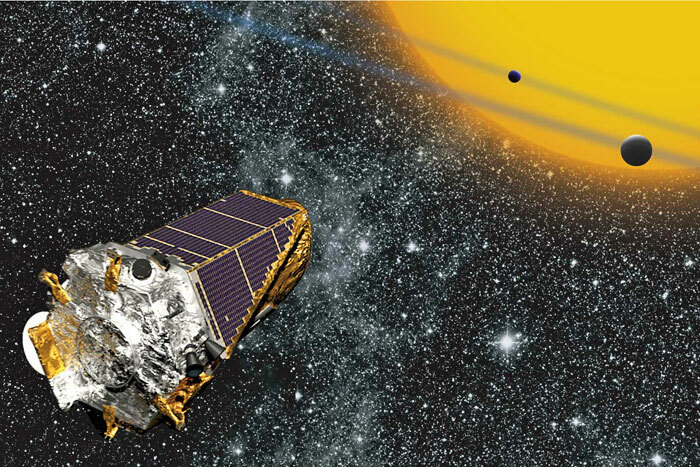 "There's still a lot of good science to come out of Kepler." in the 'habitable zones' of nearby stars. Exoplanet science is a young field. The first world beyond our solar system wasn't confirmed until 1992, and astronomers first found alien planets around a sun-like star in 1995. The instrument generally needs to observe multiple transits to flag a planet candidate, which is part of the reason why the most intriguing finds are expected to come relatively late in the mission. "Before, we were just kind of plucking the low-hanging fruit, and now we're getting down into the weeds, and things are getting a little harder," Batalha said. "But that's a challenge we knew we would have." Kepler candidates must then be confirmed - by follow-up observations using other instruments, for example, or by rigorous analysis of the Kepler dataset. That enormous dataset has allowed researchers to study alien planets in new systematic and statistical ways. In 2013, for example, two different studies used Kepler data to estimate the percentage of red dwarfs - stars smaller and dimmer than the sun - that host Earth-size planets in their "habitable zone" (the range of distances from a star that could support the existence of liquid water). Kepler has not yet discovered a true Earth twin - an Earth-size planet in the habitable zone of a sunlike star - but the mission is on track to figure out just how commonly these worlds occur throughout the galaxy, Natalie Batalha said. 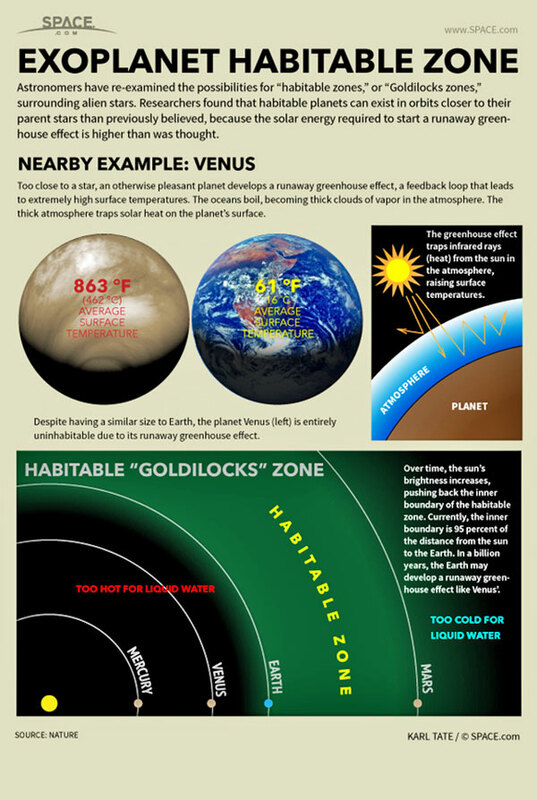 "I don't yet have a good sense of the completeness of the habitable zone; it could be that we will be sensitive toward the inner half of the habitable zone, maybe not the complete habitable zone," she said. "But I am confident now that we are going to get a number based on actual discoveries, and that we are not going to have to rely on extrapolation." The data-gathering part of that mission came to an end in May 2013, when the second of Kepler's four orientation-maintaining reaction wheels failed, robbing the spacecraft of its super-precise pointing ability. A repair mission is not going to happen; Kepler orbits the sun, not the Earth. But Kepler is still observing the heavens. In May 2014, NASA approved a new two-year mission extension called K2 for the space observatory, during which a compromised Kepler continues to hunt for exoplanets but also observes other cosmic objects and phenomena, including supernova explosions and star clusters. "So we will be well-poised when JWST launches to begin studying the diversity of the atmospheres of planets, thanks to discoveries made by K2," she said. While K2 observations continue, Batalha and other Kepler scientists are still busy analyzing data from the prime mission. NASA wants this work done by September 2017, and the team should meet that deadline, Batalha said. "Sometime around September of 2016, we'll probably have our final catalog," she said. "And then between September and January [of 2017], we'll be producing the products that will allow people to do the statistics with the catalog. And then we'll kind of write up all of our documentation and final papers, and turn off the lights and go home sometime around the end of summer 2017." But that moment won't mark the end of Kepler's contributions; NASA could extend K2 for another two years, for example. And even if the spacecraft shuts its sensitive eyes in 2016, its observations will keep researchers busy for a long time to come. 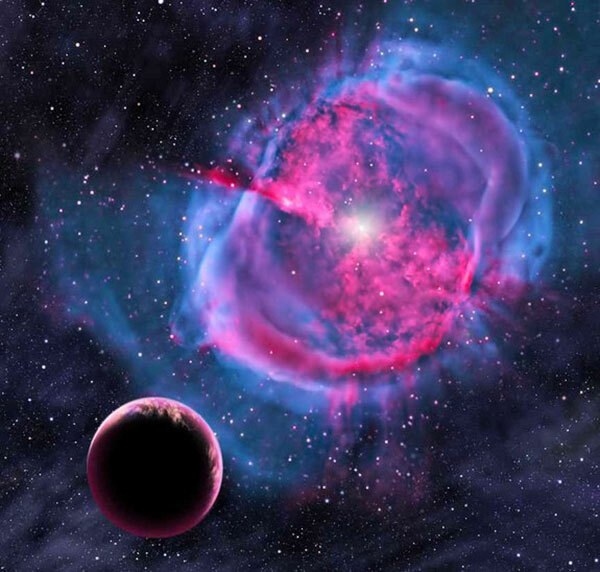 "I fully expect that scientists will be working through Kepler data - and characterizing those planets and inferring various properties of exoplanets based on that data - literally for decades," Batalha said.